If you’re looking for a simple high power LED driver circuit, then it’s here. Driving a high power LED is not that easy. First you’ve to apply proper voltage to get the maximum possible brightness and you also have to limit the current to avoid LED burn out. You might have seen other high power LED driver circuits which consists of many parts, like inductors, op-amps, different regulator IC’s , transistor feedback networks even microcontrollers. Those circuits are more efficient than this one. But the making expense and difficulty is much more high. So I’m showing you the simplest high power LED driver. In market, we can get 1Watt and 3Watt LED easily. 1Watt LEDs have ratings of Forward Voltage 3.2V – 3.6V, and Forward Current 300mA. While the ratings of a 3 watt LED are Forward Voltage: VF 3.4V , Forward Current: 700mA . So we consider 3.4volts as optimal voltage, and thus the 1 watt LED is running at 3.4×0.3=1.02 watts. For a 3 watt LED it’s approximately 2.38 watts. Finally here’s the simplest high power LED driver circuit diagram. 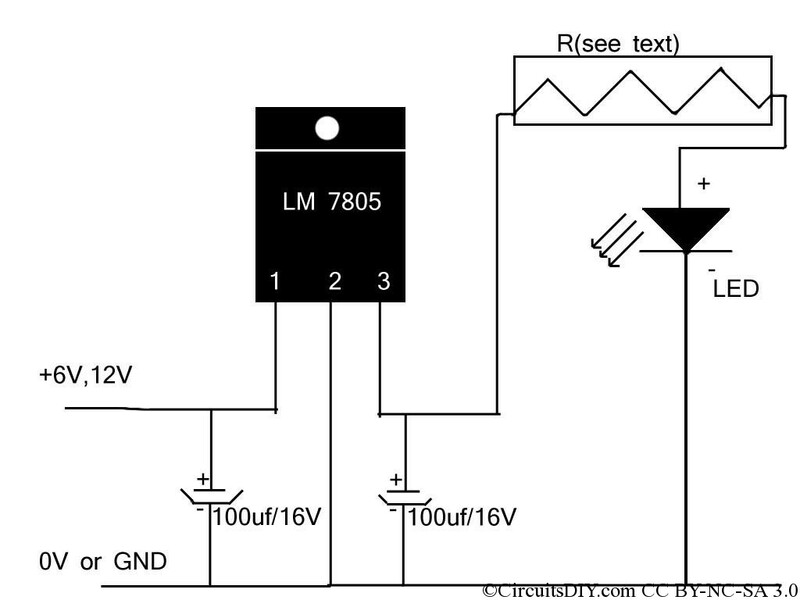 Here, for a fixed reference supply, LM7805 regulator is used. Which can deliver upto 1Amps of current. In our cases the max required current is 700ma or 0.7Amps, so no problem there. And since the resistor “R” will be eating the extra 1.6 volts(5.0-3.4). So what would be the value of R? Calculating the value of series resistor R : For the 1 watt model, there’s current of 300mA. So the value of the resistor should be 5.3 Ohms(appx) and wattage should be 0.48. Hence a 5.6Ohms 1/2 watt general purpose resistor will do the job perfectly. And similarly, for the 3 watt model, the value of R would be 2.2Ohm 1.25 watt, practically you’ve to choose a 2 watt resistor. You can feed any voltage greater than 5.5 volts, so we can run this circuit from a 6 volts to 12 volts supply. As I’ve said before, this LED driver is not much efficient, you should consider a upgraded driver in your next build, which is more efficient. There’s a good one, DIY LED driver for 5Watt LEDs, and 12V strips from 100-240 VAC . Have any suggestion or question ? Just drop a comment. I need to power 140 3w leds from one power source of different colors, could I in theory use the 5v feed from a 550w pc power supply and then just link resistors of the correct value to each led from one main power line? Or if there is no 5v feed use the 12v feed and run the power through a 7805 for each row of say 13 leds? Try either or the one that best fits you. please help us in making LED driver for 5w (12 Led in series) 3.3x 12 = 40 V , and 150 mA. Use LM317T in constant current mode. Hi we want made 12watt Led Driver on low cost please guide to us ,who can use ic/circuit. Contact me with full details through contact page. Contact me through contact page. Can you tell me what are the components that I have to buy to make a driver to each kind of leds??? I would like to know too if i can make only one driver to all leds ,and use potenciometers to each kind of leds to reduce voltages and mA. the power supply that I am going to use is a pc`s one.sorry if my questions are stupid,but I don`t understand very much of this,so if it isn`t asking to much can you make to me a design how the circuit must be??? thank you so much !!! The last one in your list doesn’t look like 3Watt. Dear Arup, Can you help me in my led light project? I want to make 3Watt-5Watt-7Watt and 10Watt home light bulb with 220V source, please help me in parts and circuit.I want to make small driver for these light . 1- can i use 2 phone batteries ( fully charged = 8,6v) and what is the value of the resistor. 2- can use a 18650 battery 2000mAh (fully charged 4,3v) if not what may i do to get it work with battery? Thanks for sharing your thoughts about are car covers waterproof. i have 1 watt Led which i want to drive from I=350ma. My source voltage is V=12V DC. Please give me a circuit diagram and how i would be calculate resister for the same? hi sir i use lm317 and 1.8ohms . my 1 watt is blow what can i do? and what resisitor at regulator i use?